Home » Events » 60th Anniversary Great Media Easter Egg Hunt! 60th Anniversary Great Media Easter Egg Hunt! The annual Egg Hunt in Glen Providence Park was started by the Media Jaycees in 1954 – making this year the 60th anniversary! In 2008, long-time event sponsor the Media Lions Club took over the event with McCarrin Chiropractic as the co-sponsor- this is their 7th year organizing the Egg Hunt. Running this event is no small task- it involves filling and hiding over 4,000 eggs! Volunteers also clean debris- and of course there is the traditional visit from the Easter Bunny to coordinate. Articles show that there were once “golden eggs” hidden, with the lucky finders getting special prizes… one long-time resident told us the grand prize was once a bike! You can read more about the history of Easter Services and the Egg Hunt in Glen Providence Park. Thank you to the Media Lions Club and McCarrin Chiropractic for continuing this wonderful community tradition! 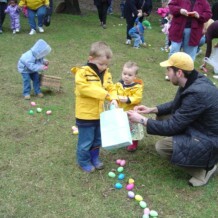 While it is the longest-running, the Egg Hunt is just one of many events that have been held in the Glen Providence Park through the years- including fireworks, Haunted Woods, and fishing derbies. Read more in our 2011 article 76 years in the park: the Swamp Man, pie eating contests & more!